If a stimulus that results in an emotional response is repeated alongside another stimulus which does not cause an emotional response, eventually the second stimulus will result in the same emotional response. 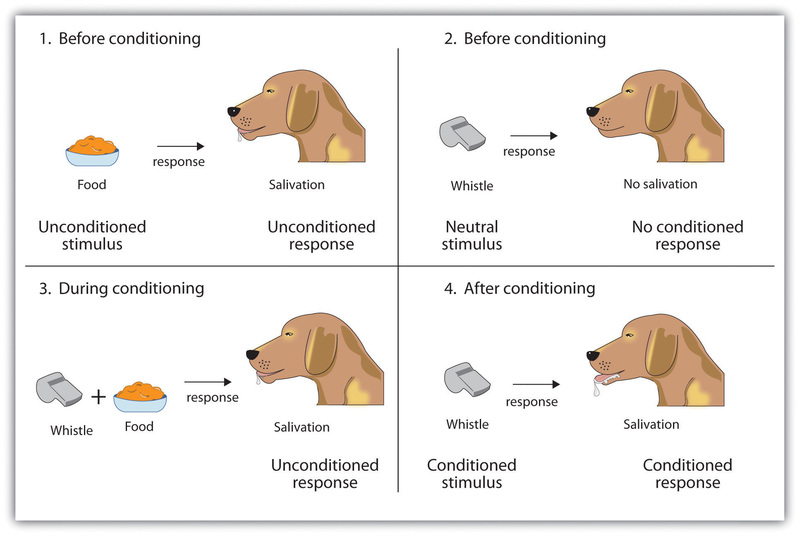 Classical Conditioning is thus ‘learning by association’. It does not work in all circumstances. In particular it is more effective where the conditioning may be of evolutionary benefit. Pavlov did famous experiments with dogs, ringing a bell and then feeding them. After a while, he could ring the bell and their mouths would salivate. Garcia and Koelling (1966) showed that rats soon learned to avoid a sweet-tasting liquid when it was followed by an injection that made them ill, but they did not learn to avoid the liquid when they received electric shocks afterwards. Presumably this is connected with learning what foods they could safely eat. The rats did, however, learn to avoid the electric shock when it was paired with light and noise (but injection+light/noise failed). Maybe this is related to learning about natural hazards like lightning or falling objects. If you want to persuade someone to do something, get them to do it at the same time as doing something they like doing. Do something specific every time they do something you want (like touching them somewhere or making a specific sound). Then do that specific thing and they’ll think of doing the desired behavior. Watch out for people repeatedly touching you or having strange behaviors. Check that they’re not trying to program you.